I have been wanting to make a cranberry cheesecake for Thanksgiving for a few years now, but recently found this version that not only includes cranberries, but eggnog as well. I absolutely loved the idea, as the flavors are the perfect bridge between the Thanksgiving and Christmas holidays. Cranberries tend to only be associated with Thanksgiving, while eggnog is typically reserved for Christmas holiday festivities. Combining the two is totally genius; the result is a dessert that can be enjoyed, and is perfectly seasonal, from November all the way through the new year! I’ve grown to love both cranberries and eggnog as an adult, and this combination of flavors just flat-out works. 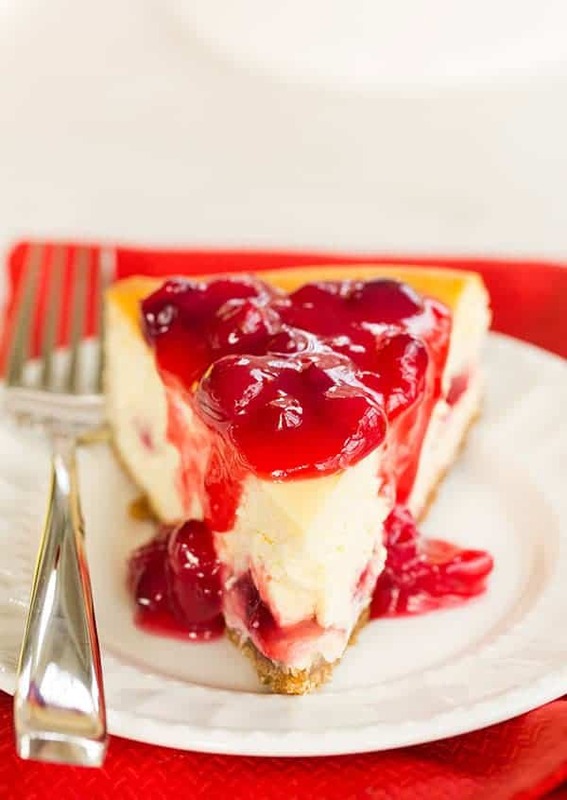 The smooth and creamy cheesecake is spiked with a big dose of eggnog, while a mixture of cranberries, cranberry juice and sugar is thickened with cornstarch and swirled into the cheesecake, and then also used for the topping. While you could use regular ol’ graham crackers for the crust, I used cinnamon graham crackers, which I thought was a fantastic complement to both the eggnog and cranberry flavors. Whether you make this cheesecake for dessert on Thanksgiving or save it for a Christmas celebration, it definitely deserves a place on one of your holiday menus! Four years ago: Happy Thanksgiving! 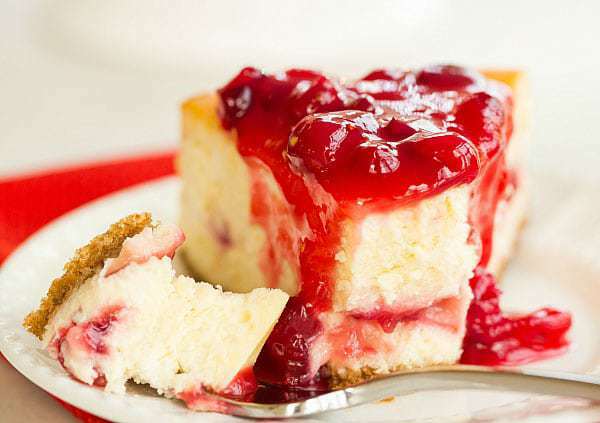 An eggnog cheesecake recipe with a cranberry jam swirl. Preheat oven to 325 degrees F. Grease a 9-inch springform pan. Make the Cranberry Mixture: In a medium saucepan, whisk together the sugar and cornstarch. Whisk in the cranberry juice until smooth, then stir in the cranberries. Place the pan over medium heat and bring to a rolling boil. Cook and stir for 2 minutes, or until thickened. Remove from the heat. Make the Crust: In a medium bowl, stir together the graham cracker crumbs and sugar. Drizzle over the melted butter and toss to combine, ensuring that all of the crumbs are moistened. Turn the crumbs into the prepared pan and press into an even layer in the bottom of the pan. Place the springform pan on a rimmed baking sheet. Bake for 10 minutes, then cool on a wire rack. Make the Cheesecake Filling: With an electric mixer on medium-high speed, beat the cream cheese and sugar until smooth and fluffy, about 3 minutes. Add the flour and beat until combined, about 1 minute. Reduce the mixer speed to low and add the eggs one at a time, mixing until each is completely combined and scraping the sides of the bowl between each addition. Add the eggnog and vanilla extract and beat until just combined. Pour two-thirds of the cheesecake batter into the prepared pan over the crust. Top with half of the cranberry mixture (cover and refrigerate the remaining cranberry mixture). Slowly pour the remaining cheesecake batter into the pan. 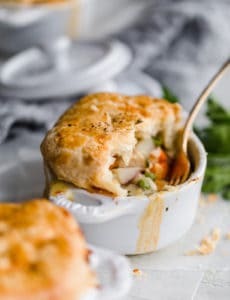 Return the springform pan to the rimmed baking sheet and bake until the edges are set and the center jiggles slightly, about 1 hour 15 minutes. Place the springform pan on a wire rack and cool for 10 minutes. Run a knife around the edge of the pan and cool for an additional 1 hour. Place the cheesecake in the refrigerator and chill overnight, at least 8 hours. When ready to serve, remove the sides of the pan and top with the remaining cranberry mixture. Leftovers should be stored in the refrigerator for up to 5 days. I love this recipe. I have made it several times and it is a sure crowd pleaser!! 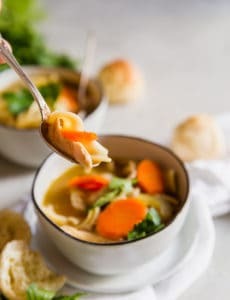 I just made this and it was delicious! So creamy. I actually added a sour cream topping and then put the cranberries on that. It looked so gorgeous – everyone raved about both its looks and its taste. Thank you! I was hunting for a cranberry cheesecake recipe I saw on tv years ago, and I am THRILLED to have happened upon yours. All other Thanksgiving desserts just got pushed off the menu! I discovered that baking with eggnog instead of milk works in a lot of recipes a few years back, but this flavor combo never occurred to me. 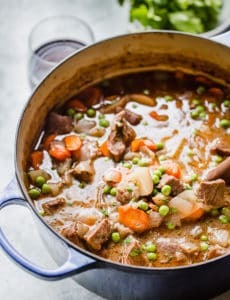 I am so excited to try this recipe that I am boarding on giddy. I do have one question: I am partial to cranapple juice, and I am also aware a lot of cranberry juices aren’t 100% juice. Do you think the cranapple would work, both in taste and juice%? How important is it to use 100% juice? Tried this for my work Christmas party and it was a hit. I loved the flavor and texture. At first I thought the eggnog taste could be more pronounced but after finishing a slice I realized that the subtle taste was much better. I did have issues with the cranberry “layer” inside the cake. My batter was very wet and runny which I imagine is how it should be however, when I poured half the jam/sauce into the cake it immediately sank to the bottom. When sliced you had crust, layer of cranberry jam and a giant layer of cheesecake. How do you keep a filling more in the middle? Just bought my first carton of eggnog! This cheesecake looks delightful! This must be fantastic! Congratulations for the idea! :) If I find cranberries (unfortunately they are uncommon here in Italy) I’ll surely try it! Gorgeous cheesecake! It has all the flavors of the season and the burst of color is fab. I live in the Netherlands and although we do not have a feast like Thanksgiving in the US, we typically eat cranberries on Christmas! Really nice pics and i bet it was so creamy. 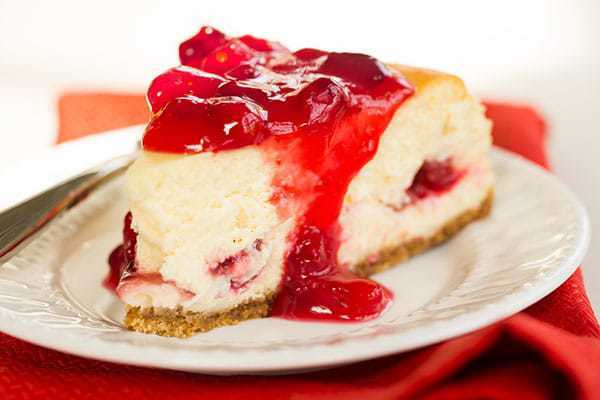 love this combination – the cheesecake looks perfect!! Love the cranberry eggnog combination! this cheesecake is seriously so pretty. the colors are amazing! This went RIGHT on my menu!! You are a genius. Happy Thanksgiving to you and your family! This looks amazing! I adore both cranberries and eggnog! What brand of graham crackers did you use? I’ve never seen them here in Toronto but I will definitely look out for them, or I will pick them up on my next Buffalo trip! Such a great idea! Hi Katie, I buy Nabisco. Cranberry sauce is my favorite Thanksgiving side and eggnog is hands down my favorite Christmas drink. This is a match made in heaven for me!!! This is such a BEAUTIFUL cheesecake! It is now on my Thanksgiving dinner menu. Until seeing this cheesecake, I had planned for a rather ordinary Thanksgiving dessert table . . . pumpkin pie, pumpkin roll, spice cookies with pumpkin dip, carrot cake . . . ordinary. Until now . . . this cheesecake will be the “crown jewel” of the dessert table :)) Thanks, Michelle, for the inspiration, lovely pictures, and sharing your recipe. Happy Thanksgiving! What is the name of your husband’s blog? I love this combo idea! 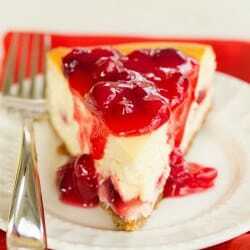 I had never really thought if including cranberries in a cheesecake before. I love the combination! Really so festive. It looks amazingly delicious. YUMMY! Mhhhhh sounds delicious! I will definitely try this one out! This is really a great post! Michelle I know you love your cheesecake and this is one of the prettiest ones you’ve ever made! So festive for the holidays! Pinned! Cranberries AND eggnog…genius!